This chicken broth is a rich chicken bone broth which adds depth to a soup if it is used as the liquid in a soup recipe, or it can just be sipped as a nourishing hot drink on a cold day. You can warm it up and add in just a few ingredients, for an instant soup. You can also use this broth to cook grains. 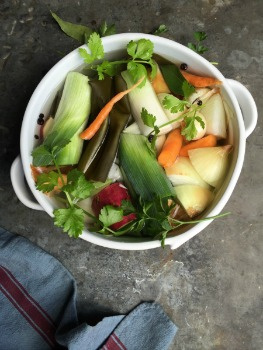 This broth is a cornerstone recipe for Roots to Health. It was created by Rebecca Katz who is an accomplished Chef and Nutritionist and who works with the country's top wellness leaders. Use it as a stock for making soups or drink it as a hot or cold drink. You can visit Rebecca's blog here. You can see a delightful video of Rebecca making this broth here.